Located in north-central Montana, the City of Havre is located in a geography that sees summer temperatures over 100oF (38oC) and winter temperatures that can plunge as low as -40oF (-40oC) accompanied by sustained arctic winds of over 20 mph. 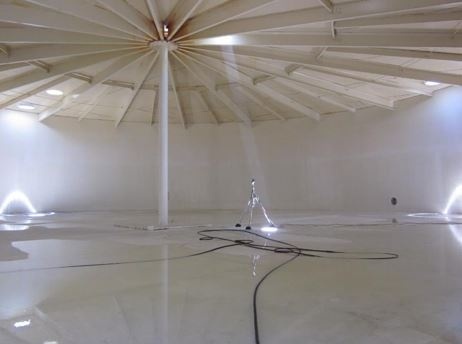 They realized that adding simple mechanical mixing to their newly refurbished 3.5 MG West Water Tank would solve both the potential summer water quality and winter asset protection issues. In 2017, the City added a PAX PWM 400 tank mixer to the West Water tank. The 0.5 HP PAX mixer was sized to ensure the entire tank volume would be fully mixed (over six tank fully mixed (over six tank turnovers per day) with temperature convergence throughout the tank to 0.9°F (0.50°C) between any two internal locations. By eliminating temperature stratification, the tank would get the maximum benefit of the incoming warmer water in the winter; reducing the chance for ice formation. In the summer, full mixing of the incoming water with higher chlorine concentrations would help to prevent biofilm formation and allow for a consistent disinfectant concentration in the tank volume.